Join Adventure Café for a day of cycling with a group of like-minded people. This trip has been devised predominantly as a test to your fitness levels for a more serious cycle ride such as the Coast to Coast or London to Paris. 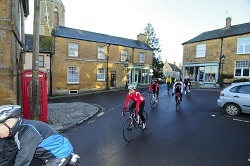 However, a 62 mile or 100km cycle ride – it is a challenge in itself! A day that will both tire and inspire you. 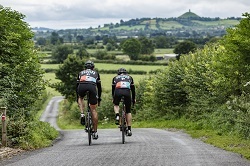 Starting the day with a civilised cup of tea in the beautiful Somerset village of North Curry, this cycle ride will take you over the Mendip Hills, through the impressive Cheddar Gorge and via historic, mystical Glastonbury. We will also run through some basic bike maintenance during the day – hopefully not for real! Your leader will take all the navigational worries from you and will be a good source of information regarding the tougher cycling challenges Adventure Cafe run. Meet at North Curry Village Centre at approx 09:30. After a cup of tea and a briefing we’ll set off cycling. The cycle ride will last approximately 5-6 hours, which will include stops for re-grouping, lunch and a couple of basic bike maintenance sessions. There will be a couple of timed, measured sections for you (and us) to assess your current fitness levels in respect of a further extended challenge. Your leader will encourage you to cycle at a speed which will give you an indication of what you need to maintain on one of our longer cycling challenges. We expect to finish around 16:30 in time for another cup of tea (and maybe a slice of well deserved cake) and, of course, a chat about your next challenge! Journey home - tired and looking forward to the next one, or maybe the Big One! What is a Level 2.5 Cycling Challenge Like? For this type of challenge - you can expect either distance (up to 80km), or altitude gain - around 5-600m. But not both! If you climb, then the distance will be less, if you cover the distance, then the altitude gain will be little. Typically road conditions will be good - although there are exceptions to this. If you encounter rough road conditions (or it is a mountain bike challenge), then the distance / altitude will be reduced. These events would suit someone of good all round fitness, who takes exercise regularly - without neccessarily being of high specific cycling fitness. How Fit Do I need to be to join a Level 2.5 ‘Bike Ride’? You must be active and with moderate fitness level. You should be taking regular exercise, consisting of regular bike rides and possibly other sports (swimming / football etc.) You should be comfortable in undertaking long country rides of up to 6 hours or 60 km in the lowland English countryside. Your training rides will encounter a few reasonable length hills. This training / fitness assessment day is ideal to demonstrate your fitness for one of our longer rides such as London to Paris or a further afield challenge. Please call us and discuss your cycling background. Transport to and from start location. Please plan to experience everything from glorious burning sunshine to rain and even snow or hail. Please ensure you pack sufficient water and sun protection, but also don't forget your hats, gloves, and waterproofs, as well as warm gear.